Why our Gun Debate is Off Target. He has a book coming out about his journey in March. There are some good insights. I do believe that he under-estimates the degree to which the NRA is representative of gun owners' feeling and opinions. 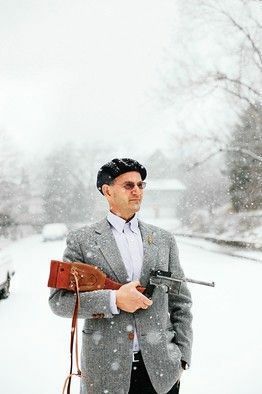 Quote: I'm a weirdo hybrid: a lifelong gun guy who is also a lifelong liberal Democrat. That there is the Cliff Notes to the rest of the article. And of course, in typical libturd fashion, he wants to impose restrictions on the purchase of firearms. Blood brother to the idiot who smashed his AR then posted his stupidity on Youtube for all to see. If he doesn't want that broomhandle, I'll buy it from him . . . . The idiots who don't secure their firearms, which are in turn stolen, need to be tarred and feathered. (02-17-2013, 05:44 PM)MrPeanut Wrote: Well, he is partially correct. If I have my fire arms in my locked house they are secured! If someone breaks in and steals them you are saying I am the idiot. I guess if your car gets stolen your the idiot for letting it happen. Maybe we should secure all of our fire arms at local police station and check them out when we want to use them that way they are truly secured. As much of the media so demonizes firearms and Hollywood works hard to glamorize violence, guns have become in the eyes of our young a forbidden fruit. Additionally, the pathetic state of education today only magnifies this perception by our youth. While traditional family values are ridiculed and parents often commit little effort toward involvement in their children's and teen's lives a simmering pot sometimes boils over. Perhaps Mr. Baum should have put some emphasis onto liberal endorsed societal norms rather than his perceived lack of gun safes. But truth be known, that wasn't his goal for penning that article now was it? If I have my fire arms in my locked house they are secured! If someone breaks in and steals them you are saying I am the idiot. What did Forrest Gump say? Rcpaul;80380 Wrote: If I have my fire arms in my locked house they are secured! If someone breaks in and steals them you are saying I am the idiot. MrPeanut;80332 Wrote: Well, he is partially correct.